DAMON- SONG OF A GYPSY. For any collector of psychedelia, if they’re lucky enough to find a copy of Damon’s Song Of A Gypsy, it becomes one of their most prized possessions. Finding a copy is another thing. Copies are rarer than hen’s teeth and are changing hands for large sums of money. Recently, copies have changed hands for thousands of dollars. Song Of A Gypsy, which was recently released on Now Again Records, you’ll realise is no ordinary album. Far from it. Privately pressed in 1969, Song Of A Gypsy was released on Ankh Records. It’s an album that pushed musical boundaries to their breaking point. A lysergic, genre-melting album, Song Of A Gypsy wasn’t a commercial success on its release. As a result, Damon didn’t release another album. Over the next twenty-five years, Song Of A Gypsy became a hugely influential album. It enjoyed a cult following. Meanwhile, the man behind Song Of A Gypsy was blissfully unaware of what was going on. By the late-nineties, David Del Conte was a middle-aged former musician, who’d settled into a routine of running his family business. That was a bowling alley he’d inherited from his father. He’d been sober for twenty years, when he’d found God. Since then, he’d began rebuilding his relationship with his daughters, who he’d previously been estranged from. David had turned his life around. When he wasn’t working, he lived in a house that near Capistrano Beach. With its view of the Pacific Ocean, life was good for David. It wasn’t until he received an anonymous caller that his previous life as a musician became public knowledge. David had become used to people asking of he was the Damon, who’d recorded Song Of A Gypsy. His reply was that he used to be. He’d gradually sold most of the copies of Song Of A Gypsy he’d left. Then one day, curiosity got the better of David, and he asked a caller how much a copy of Song Of A Gypsy was worth. When he was told a copy of Song Of A Gypsy was worth $3,000 dollars he was shocked. He agreed to sell the last copy for the $500 they’d agreed on, as long as the buyer didn’t resell the album for more that $500. It was only after David asked how much the record he recorded in 1969 was worth, that he realized he’d a cult following he knew nothing about. So what was the story behind Damon and Song Of A Gypsy? That’s what I’ll tell you. David Del Conte was born in Rochester, New York in 1941. His parents owned a beauty parlor and over the years, saved enough to buy a bowling alley in California. Packing their belongings into their car, they followed the sun to California. In Los Angeles, the moved throughout the city limits. This is when David believed his: “predestined life as a gypsy began.” Eventually, they settled in Inglewood, where his parent’s business blossomed. Then when David was nineteen, his life changed forever. His girlfriend told David she was pregnant. This was a very different era. So the pair married and went on to have three daughters. By the time David was married, he’d immersed himself in music. He was a natural musician, who’d learnt to play in high school. His first instrument was clarinet, so it’s no surprise that Benny Goodman was his hero. Soon, he was experimenting musically. A keen surfer, it was only natural that David recorded a couple of surf rock tracks. This included Lonely Surfer, which was released on Merri Records, as David Del Conte and The Castaways. Then David released his first version of Don’t Cry. After that David moved to Harmony Records, where he released Bowling Alley Jane and Don’t Cry Davy. Next stop for David was United Artists, where It Don’t Mean A Thing was released under his name. That’s despite David only supplying backing vocals. Having become a musical nomad, wandering between labels, it was only natural that David founded his own label, Del Con. It was the mid-sixties when David returned. He released singles on his Del Con label. This includes Lovin’ Man, whose B-Side is an impassioned ballad They Call Me A Fool. David’s final single for Def Con was I Wonder Why, was also released on the Ankh Records in 1968. Ankh Records was another label David founded. Tucked away on the B-Side of Ankh Records’ version of I Wonder Why was Song To A Gypsy. It was a tantalising taste of the direction David’s music was heading. Although the original version of Song To A Gypsy, which was released as a B-Side wasn’t psychedelic, David must have been considering a change of direction. After all, why did he found two separate record labels and release two different versions of the same single? David admired two very different singers, Jim Morrison of The Doors and the purveyor of faux psychedelia, Donavon. It seemed David was caught between two styles of music? One man who’d help David find his musical direction was guitarist Charlie Carey. Charlie and David met in 1967, when Charlie stood in for David’s guitarist. Soon, the pair formed a firm friendship. David’s life had been turned upside down. He was divorced from his wife, and almost estranged from his three daughters. Music was all David had now. So when Charlie met David, it was an opportune meeting. From the first chords Charlie played, David knew this was the man he’d been looking for. Here was someone with a unique style, who could almost make the guitar sing. This was a result. Despite this meeting with Charlie, David was overcome with the breakup of his marriage and not seeing his children. So, David turned to drugs. He tried what were the drugs of choice, L.S.D. and dexies. Soon, David was trying heroin. That was the last straw. Things got so bad, that David was unable to standup, never mind make it concerts he was booked to play. Quickly, David got a reputation as unreliable. That resulted in David becoming determined to get straight. Borrowing his grandmother’s cabin in Portland, Oregon, David went cold turkey. Now clean and free of heroin, David started making journey’s between his hometown and San Francisco. One day, when traveling to San Francisco, David entered the Esalen Institute in Big Sur. Having dropped two tabs of acid, David walked twenty miles to the Esalen Institute, which was managed by his school friend Charlie Farrington. Best described as a retreat or residential community, it was like nirvana for David. He wandered around playing his guitar and reveling in the atmosphere. The only thing that bothered David, was when a guitar strong broke. Later, Ravi Shankar and George Harrison visited. Tuning his guitar to the same tuning they used, David played alongside them. That tuning would prove inspiration for Song Of A Gypsy. Having left the Esalen Institute, David walked back to San Francisco, where his car was. He drove back to Los Angeles, where he and Charlie Carey began work on a two singles, Song Of A Gypsy and Poor Poor Genie. Various versions were recorded, with the final version recorded at Western Recorders, in Los Angeles. Song Of A Gypsy and Poor Poor Genie were released simultaneously in 1968. Ankh Records hired a promotion company to plug it. They worked the singles well. There was a problem though. When Poor Poor Genie was well received on American Bandstand, there was a problem, the B-Side Don’t You Feel Me was reviewed. Sadly, despite the marketing campaign, neither single sold well. Maybe the album Song Of A Gypsy would fare better? Accompanying Damon for what became for Song Of A Gypsy, were a tight, talented band. They recorded ten songs Damon wrote. The band included a rhythm section of drummer Carl Zarcone, bassist Atley Yeager and Charlie Carey’s “singing” guitar. Lee and Mike Pastora added percussion, Helena Vlahos finger cymbals and Richard Barham goblet drum. 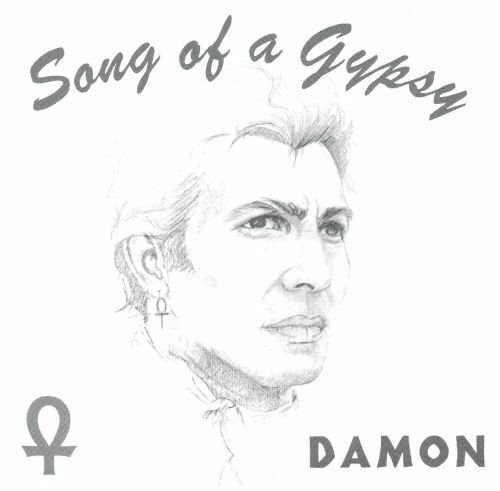 Damon sang lead vocal and played guitar on Song Of A Gypsy, which was released in 1969. Just like the two singles, success eluded Song Of A Gypsy. Released on Damon’s Ankh Records, the label didn’t have the budget to promote the album. Instead, Damon tried promoting Song Of A Gypsy by performing live. That didn’t work. He wasn’t well received. Worse was to come. The original master tapes of Song Of A Gypsy disappeared. Things couldn’t get much worse. Could they? That’s what I’ll tell you. once I’ve told you about Song Of A Gypsy. Opening Song Of A Gypsy is the title-track. Guitars scream and soar above the arrangement. They answer Damon’s browbeaten vocal. His vocal is almost bereft of emotion, as if life has ground him down. Behind him, a meandering arrangement features a myriad of percussion and rhythm section. As psychedelia and rock melt into one, Damon’s vocal is a soul-baring cry for attention. Poor Poor Genie sounds as if it was recorded around 1968. It’s very much of its time. That’s no bad thing. It’s something of a hidden psychedelic gem. As the rhythm section and percussion provide a pulsating heartbeat, fuzzy, muted guitars match them every step of the way. Damon’s wistful vocal is punchy and urgent, sadness and regret in his voice as he sings: “ Poor Poor Genie why don’t they leave her alone.” Then almost enviously, he adds” “at least she’s got some soul. As Don’t You Feel Me unfolds, crystalline guitars are panned left, while percussion and the rhythm section join forces. Damon seems to draw inspiration from the Lizard King, Jim Morrison. His vocal is best described as haunted and melancholy. Like a Byronic figure, he delivers the lyrics dramatically. He brings meaning and emotion to the lyrics, with what’s his best vocal so far. There’s an element of mystery in Did You Ever, where rock, folk and psychedelia melt into one. Like a lysergic sage, Damon delivers the lyrics to this surreal, love song. Charlie Carey’s guitar answers Damon’s vocal. When the vocal briefly drops out, Charlie showcases his virtuoso skills, against the shuffling arrangement. Filters are added to Damon’s vocal, adding a further sheen of mystery in this lysergic, surreal paean. Funky Funky Blues is very different from the previous tracks. Damon jives while his band fuse musical genre. Everything from funk, blues, rock and psychedelia are fused by the band. Vamping and jiving his way through the track, Damon again looks to Jim Morrison for inspiration. There’s also a nod to the vocal talents of B.B. King, Donovan and Rufus Thomas, during three genre-melting minutes of sassy, funky, blues music. Do You has a real Eastern influence. It’s apparent from the opening bars. Damon’s vocal has a dreamy, lysergic sound. With its laid-back sound, harmonies accompany him while Charlie Carey’s guitar is ever-present. It plays a huge part in the track, add layers of sound and adding a contrast to Damon’s dreamy, faraway vocal. Sunshine pop, psychedelia and rock. It’s all gone into the making of this dreamy slice of wistful psychedelia. During The Night, Damon paints pictures evocative pictures with his vocal. His delivery is deliberate and dramatic, while a myriad of percussion and the rhythm section provide a backdrop. Playing a starring role is Charlie Carey. His guitar playing is a perfect foil for Damon’s vocal. It sings, answering Damon’s call. While melodramatic describes Damon’s vocal, Charlie’s playing is no frills. They both play their part in what sounds like a musical period drama, with Damon and Charlie playing starring roles. Feel Your Love has a much more thoughtful, understated sound. This is perfect for Damon’s slow, seductive vocal. Needy and sensual, his vocal is full of longing. Guitars chime, while the rhythm section and percussion meander along. Adding the finishing touches are the harmonies. It’s as if they’re giving thanks for Damon’s heartfelt and beautiful vocal. Guitars reverberate into the distance on Birds Fly So High, as the shuffling arrangement introduces Damon’s dreamy vocal. Like a slice of aural sunshine, his vocal paints pictures. Harmonies accompany him while guitars chime and the rhythm section and percussion provide the melancholy heartbeat. Closing Song Of A Gypsy is Road Of Life. A hesitant guitar reverberates, before Charlie plays his way into the track. Way deep down, the bass booms and drums mark the beat. Damon’s vocal is half-spoken. He sounds like a psychedelic seer, as he delivers the lyrics. They’re a reminder of the idealism of the sixties. As he scats, psychedelia, rock, jazz and folk unite, bringing back memories of another era, when life was very different and Damon looked like having a successful career in front of him. Sadly, that wasn’t to be. After Song Of A Gypsy’s commercial failure, Damon decided to try other career paths. An agent tried to get Damon a job in the film industry. That wasn’t for him. Then his life spiralled out of control. By the mid-seventies, Damon was reduced to robbing drug dealers at gun point. Then when someone pulled a gun on Damon, he realised it was time to change his ways. He couldn’t go on hustling. So in 1979, Damon found himself in a drug program. His real reason was, he was hiding out from a couple of drug dealers he’d robbed. Then there was this woman who Damon had taken a shine to. Whether it was fate, Damon decided to mend his ways. He found religion and gave up drugs. Turning his back on his wild ways, he somehow, managed to turn his life around. Twenty years later, and Damon was back living in Capistrano Beach, running his family business. That’s when he discovered that his debut album Son Of A Gypsy, had acquired a cult following. More than that. Son Of A Gypsy was a lost psychedelic classic. With copies changing hands for several thousand dollars, very few people were able to hear Song Of A Gypsy. Even previous rereleases on CD were rarities. So, when Now Again Records decided to rerelease Song Of A Gypsy, it was a welcome rerelease. Best described as a lovingly compiled and lavish rerelease, Now Again Records’ rerelease of Song Of A Gypsy, is like a mini hardback book. Featuring in-depth sleeve-notes, including an interview with Damon, it’s one of the most lavish rereleases of 2013. As for the sound quality, it’s exquisite. Time has been taken and money spent on getting the sound on Song Of A Gypsy, as Damon originally intended. This is a fitting makeover for Song Of A Gypsy. After all, Song Of A Gypsy is an innovative, genre-melting, boundary pushing album. For anyone whose interested in psychedelia, then Song Of A Gypsy is a must-have album. Everything from blues, folk, funk, psychedelia, rock and soul can be heard on Song Of A Gypsy. With its lysergic, ethereal and dreamy sound Song Of A Gypsy is now within the budget of music lovers everywhere, who now can hear this lost psychedelic classic in all its glory for the first time. Standout Tracks: Song Of A Gypsy, Poor Poor Genie, As Don’t You Feel Me and Birds Fly So High. ← BOB MARLEY AND THE WAILERS-CATCH A FIRE. great article….I knew David in 1960 when we were Street Racers in Inglewood, California. He and his 57 TBird and I with my 1960 Dodge Ramchargers in Black…David, I had your number then! Sounds like good times. Hope you enjoy hearing your old friend on the reissued version of Song Of A Gypsy.